Apple Computer made a small but portenteous change to its iTunes software this week: It added a podcast function. For those of you who don't follow the techology press, podcasting is a much-discussed technology that promises to do for the spoken word what blogging has already done for the written word. Podcasting allows pretty much anyone with a computer and a microphone to disseminate audio "podcasts" (the Apple iPod being the preferred method of playback, hence the name) on a subscription basis across the Internet. A few MSM giants—Disney, ABC, NPR, the BBC—have dipped a careful toe in the podcasting waters, but for the most part the podcasting community is still a small, grassroots phenomenon. From what I can see, it's some years away from producing an Edward R. Murrow—or even a Glenn Reynolds, for that matter. But the technology is moving quickly—and just took a huge leap forward with Apple's endorsement of it in iTunes (and its latest generation of iPods). 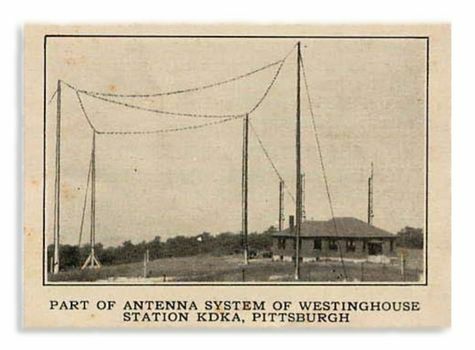 And already some are predicting a "radio renaissance." Experts say [podcasting] could change the face of broadcasting forever. James Beechinor-Collins, editor of gadget magazine T3, said: 'This is really going to be something of a saviour for many radio stations. The podcasting idea was tried out by the BBC late last year, using Melvin Bragg's Radio 4 programme In Your Time. More than 70,000 people downloaded the show and the BBC now has dozens of shows available for download, including Radio Five Live's Sportsweek and the 8.10am main interview on Radio 4's Today Programme. Today's announcement from Apple means online listening figures are set to rocket as previously iPod owners had to download separate podcasting software to download shows. Apple hopes that by making it easy for users to download the programmes, it will drive more traffic to its online iTunes Music Store, where the company has over 3,000 free podcasts available. Still, the loss will be their own. Podcasting—along with its sister technologies, iTunes, the iPod and the Apple Music Store—seems to be here to stay. And that's a lot to say for any Internet-based techology nowadays. 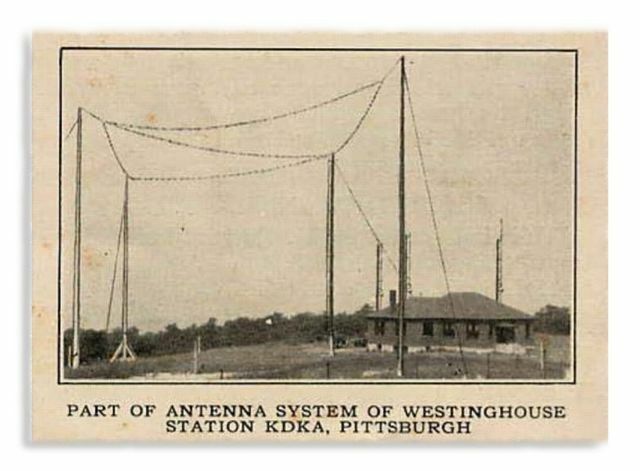 Will it transform broadcasting as we know it? Or, then again, maybe they will. 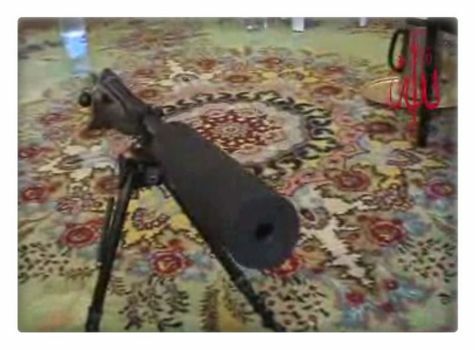 A new video by the Mujahideen Army, "Engineering," focuses on the insurgency's new predilection for silenced weapons. Meanwhile, in a statement titled “War Criminal Rumsfeld’s Pretensions,” they assured their followers that they “never and will not ever [sic] negotiate or meet with the American enemy.” Also in the message, the Rafidan boys went on to say that they'd never negotiate with any entity appointed by the American officials or those who “pretend to support and nationalism." I guess recruiting new jihadis gets a little tricky when word leaks out that you're engaged in cease-fire talks with "War Criminal Rumsfeld." In the name of all the factions that fight under our command, we declare to you, that we did not in the past present or the future, and will not sit on the negotiating table with the American Occupation forces or war criminal representatives. We also declare: That we did not conduct any negotiations with any person, party or group which either came with the occupying forces or claims to represent the vision of the Iraqi people. This is yet another game that the enemy plays to deceive his people into submission after they discovered his lies, also to try and create wedges between the Iraqi resistance, Which also shows how much they really know about what kind of people are fighting them. Rafidan the political committee has issued release No. 12 to explain to our people the reasons behind this new game. Especially the latest claims by the occupiers and their puppets, of them negotiating with us or the Mujahideen Army, The Islamic Army of Iraq, or any of our fifteen factions. We do not negotiate with criminals and bush must realize that he is defeated in Iraq, and there is no more margin for his maneuver and we will bring to trial all the war criminals and traitors and bring punishment to those who betrayed the religion, nation and people. We also confirm that an operation was to be carried out to assassinate the so called Iraqi minister of Electricity, A minister to a ministry and nation without electricity;. The traitor, Ayham Al Samaraie, unfortunately the operation failed due to a technical problem. We will get him the next time! They're also claiming responsibility for Tueday's downing of an AH-64 helicopter, which resulted in the deaths of two American crew members. The group says the shoot-down is evidence they haven't been involved in negotiations with the U.S. 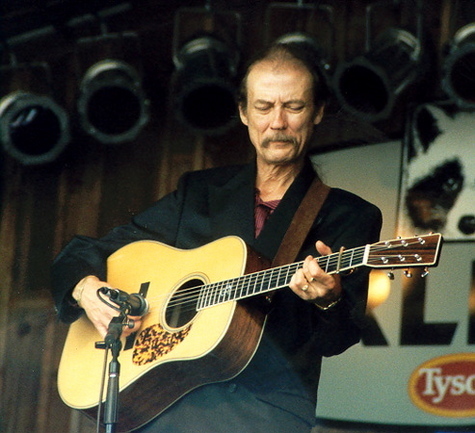 I went back to the Mayville Bluegrass Festival last weekend to hear Tony Rice. Tony is one of a small group of acoustic musicians who play a limited concert schedule to comparatively small audiences. They are practitioners of what I call "living room music"—an approach to playing that's rooted in an era when music was played, unamplified, for the edification of a select few. Tony lost his singing voice a few years ago to muscle tension dysphonia, a condition brought on by overuse and strain. It was a difficult thing to listen to him play "The Last Thing on My Mind" in a purely instrumental arrangement, remembering how beautifully he used to sing it. But it's also evident that the loss has deepened his love affair with the guitar. Rice sees himself as a kind of medium, through which the guitar's voice is channeled. And the voice speaks in many languages: bluegrass, "spacegrass," old-timey, blues and jazz. A highlight of the concert was a stunning performance of George Gershwin's "Summertime," performed as a solo and then a duet with bassist Bryn Bright (who may well be the finest performer on that instrument since the late Scott LaFaro). There is nothing scripted or studied about a Tony Rice performance. It's a spontaneous movement of the heart, a flurry of notes that seems to come from someplace altogether beyond time. And time is something that Tony Rice seems to control from the moment he steps on the stage. Measures and phrases are infinitely extensible, and melodies linger in the cool evening air, somehow just out of reach. "I quit adhering to any kind of schedule years ago," Tony says. "I take it a day at a time." Tony's an American original, one of the last of a vanishing breed. As George Gobel used to say, you can't hardly get that kind no more. UPDATE: There's a nice review of the Mayville Bluegrass Festival—which at $15 for a two-day pass has to represent one of the greatest entertainment bargains around—in The Buffalo News. Festival founder Bill Ward better watch himself; he may wind up becoming a cult figure like Bill Graham or George Wein one of these days. Just caught the TRU performance at the Mayville Bluegrass Festival - great show. Looked like the guys (and gal - Ms. Bright) were having a great time, as was the audience. It was a little chilly, but that's early summer in Western NY for you. It looked like it took a few tunes to literally get warmed up! I hope Tony's comment regarding wanting to come back to Mayville next year comes to fruition. 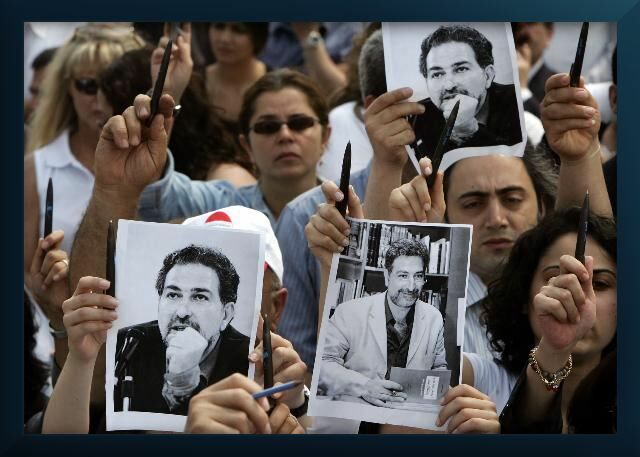 Grieving Lebanese journalists stood in silence last Friday in Beirut's Martyrs' Square to denounce the assassination of outspoken anti-Syrian writer Samir Kassir. Journalists and media personalities gathered at Martyr's Square in downtown Beirut, standing silently with their pens in the air paying homage to their slain colleague. Many Lebanese, including Joseph Loutfi, accuse Syria of orchestrating the bomb attack. "It's given adrenaline for other people to go down to the street and say that we are not in a state of peace," he said. "We are still in a state of assassination chain. Because after assassinating Mr. Hariri, we protested against Syria, and we said, 'it's cool now, we have to rebuild our Lebanon.' But after yesterday, they have told us, 'you Lebanese people, you are not in peace. We are not finished yet. We can kill wherever we want.'" The death of former Prime Minister Rafik Hariri in a bombing in February united the opposition parties to demand the withdrawal of Syrian troops, who had occupied the country for three decades. A United Nations team has confirmed that Syrian troops have left the country, but many still believe that Syrian intelligence officials are operating inside Lebanon. "There continues to be instability in Lebanon," Secretary of State Condoleeza Rice said today, "which has led to the assassination of at least three figures of the anti-Syrian opposition, and we are concerned that there could be others. We call on the Syrian government to do everything it can to deal with the instability that it is helping to create there." The Newspaper Guild, an organization that recently proclaimed its commitment to "the safety of journalists in war zones and throughout the world," has expressed outrage—though not at the Syrian officials who likely ordered the hit on Kassir. No, they're outraged at the "right-wing attack-dogs" who had the temerity to question Guild president Linda Foley's assertion that U. S. troops were "targeting" journalists in Iraq. Linda Foley has become the latest target of right-wing extremists, who have mounted a multi-media attempt to force her resignation over comments made May 13 at a media conference in St. Louis. The campaign, started by Sinclair Broadcasting, Fox News and the Washington Times, then fanned by a growing number of bloggers, echoes a similar effort that earlier this year forced the resignation of CNN news chief Eason Jordan. To their credit, quite a number of other left-leaning individuals and organizations— from the Committee to Protect Journalists to Robert Fisk—have stepped forward to condemn the murder of Samir Kassir. Maybe they were too busy fulminating about "right-wing extremists" to notice that one of their fellow journalists had actually been targeted and killed. UPDATE: June hasn't been a very good month for journalists around the world. A journalist was shot and critically wounded in Kosovo; another shot and killed in Somalia. On Saturday, a correspondent for the al-Arabiya television network was shot by terrorists during an attempted kidnapping in Baghdad. The Newspaper Guild has been silent on these "targetings" of journalists as well—perhaps because, like the Kassir assassination, none of them can be blamed on the U.S. military. In fact, the Committee to Protect Journalists has compiled a list of 23 journalists killed around the world in 2005, who "either died in the line of duty or were deliberately targeted for assassination because of their reporting or their affiliation with a news organization." The number of these deaths that can be attributed—in any way—to U.S. military involvement? Last week, former President Jimmy Carter called on the Bush administration to close down Camp Delta in Cuba—and "the two dozen secret detention facilities run by the United States." Although Carter was careful to distance himself from Amnesty International's absurd characterization of the Guantánamo facility as "the gulag of our time," he found no difficulty in recycling that organization's unsupported assertion that the United States is operating "an archipelago of prisons around the world, many of them secret prisons, into which people are being literally disappeared, held in indefinite, incommunicado detention without access to lawyers or a judicial system or to their families." But where, exactly, are the other 24 secret prisons that Carter and AI allege the U.S. is operating? The principal news source for their allegation would seem to be this article, which conveniently appeared in the left-wing London Observer on the same day William Schulz, executive director of Amnesty's Washington office, made the "archipelago" charge. The ghost prison network stretches around the globe. The biggest American-run facilities are at the Bagram airbase, north of Kabul in Afghanistan, Guantanamo Bay, where around 400 men are held, and in Iraq, where tens of thousands of detainees are held. 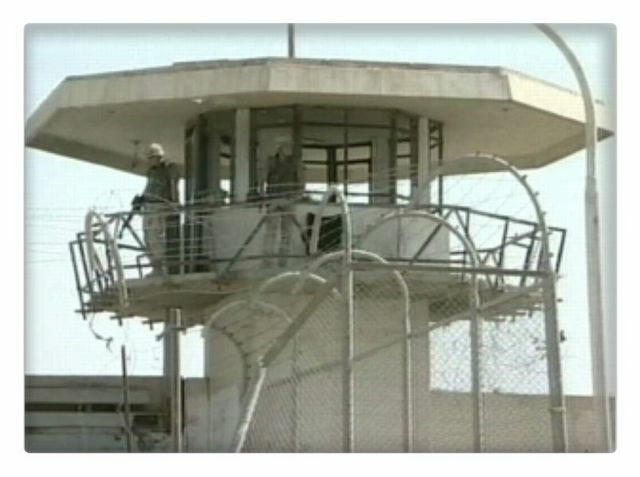 Saddam Hussein and dozens of top Baath party officials are held in a prison at Baghdad airport. The prisons in Iraq and Guantánamo have been vilified in the mainstream media since their inception; the facility at Bagram, though perhaps not a household word, has been reported on for years. Lack of notoriety isn't the same as secrecy, however. The federal correctional institutions at, say, Beckley, WV, or Safford, AZ, aren't particularly well known, but that doesn't make them secret. Although Mr. Burke cites numerous foreign prisons where terrorists (strike that, alleged terrorists) are being deprived of their right to orange-glazed chicken, he cites no other specific instances of U.S.-run detainment facilities in other countries. Indeed, he flatly contradicts the notion that"the United States government … is running an 'invisible' network of prisons and detention centers" with his later assertion that "Washington is relying heavily on its allies." If the 24 alleged secret detention facilities are run by governments of sovereign nations, then how can the U.S. government shut them down? If they're run by the U.S., then where are these secret facilities that Jimmy Carter and Amnesty International claim to know about? After all, Tailgunner Joe had to produce his. To demonstrate clearly our nation’s historic commitment to protect human rights, our government needs to close down Guantanamo and the two dozen secret detention facilities run by the United States as soon as practicable. I think that we need a fresh start … a clean slate for America in the Muslim world. I think we should end up shutting it down, moving those prisoners. Those that we have reason to keep, keep. And those we don't, let go. 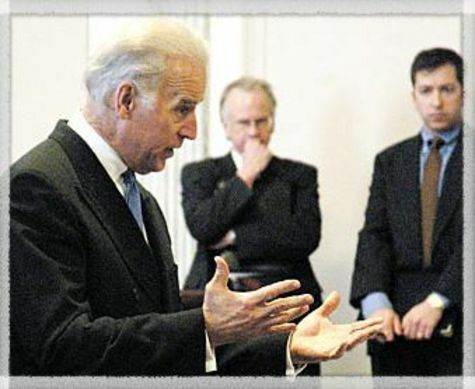 —Senator Joseph R. Biden, Jr.
Sure, a few may come back to haunt us. 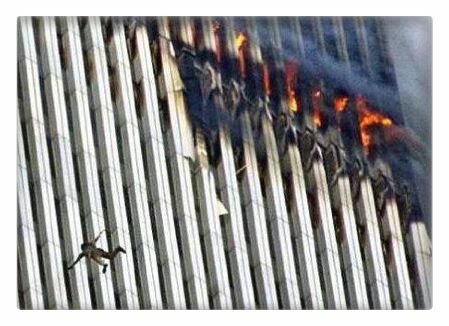 UPDATE: Jim Manion emailed me with this very moving reminder of 9/11 by Patricia de Jong, a citizen of the Netherlands. It effectively complements the photograph above. The Islamic Jihad transmitted the pictures by e-mail to a reporter in the West Bank. They show two Qurans with torn pages. The militants said prisoners took the pictures with cellular telephones sent them electronically to militant leaders. The militants said Wednesday that soldiers desecrated six or seven Qurans as they searched Palestinian prisoners' cells at the Megiddo jail in northern Israel early Tuesday. The prisoners were outside the cells at the time but could see what was going on, the Islamic Jihad militants said. 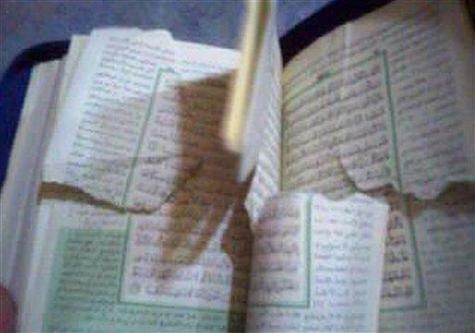 The charges closely followed a report in Newsweek—later retracted—that American soldiers flushed a Quran down the toilet at the Guantanamo Bay prison in Cuba. The report set off deadly riots in the Muslim world. The so-called "Political Committee of the Mujahideen Central Command" must be working away on their little iMacs 24/7 these days. In just a couple of months, "Dale Stoffel: The Movie" (aka "Rafidan") has spawned almost as many sequels as "Friday the 13th" did in 25 years. 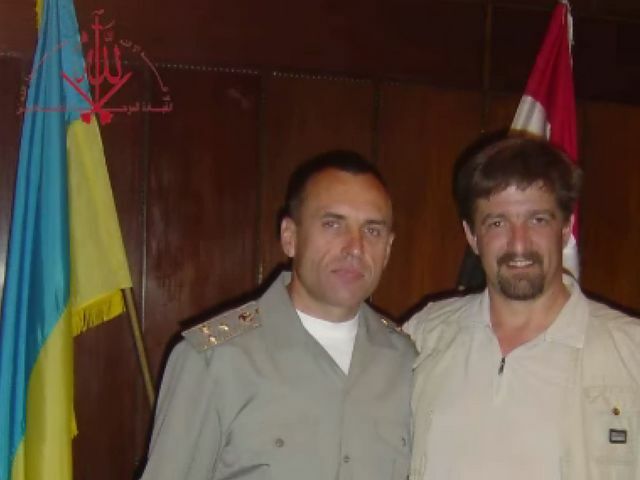 The latest installment (available for download in .wmv format here) marks the tenth in the series—and finds our hero (that's him on the right with Major General David H. Petraeus) at the heart of a vast multinational conspiracy to smuggle 70 million tons of brass out of Iraq. Where did 70,000 tons of Brass and Copper [go]? We read hundreds of books about the disappearance of Gold on a German train during the second world war, we urge those who opposed the war on Iraq in America and Europe to demonstrate their humanity, and assist in discovering where did 70,000 tons of Brass/Copper disappear and its value today exceeds 350 million U.S. Dollars. All was in the factories of the Iraqi Army and within the territory of Occupied Iraq which is under the legal control of the U.S.
We summarize to you hundreds of emails which may shed light on this case. Dale Stoffel, Bush's envoy in Iraq, was of knowledge and plan of all what is available under the disposal of the Iraqi military industrial complex thanks to the espionage reports of the United States Nations inspection teams that searched Iraq for WMDs. For this he wrote to several parties to sell the stock we include a letter dated 12th of Aug 2004 M addressed to Coskun Akdeniz seaming of Turkish Origin, and according to Exhibit 14 there are to main standards of this material stock 30/70 & C260/C230. The main plant in Fallujah was erected by an Austrian company in 1988 and houses 70,000 Tons of Brass/Copper mix. What Rafidan Says is that they not only stopped at stealing the Oil, not did they stop at selling the Iraqi military equipment valued at no less than 40 billion U.S. Dollars, not did they stop at stealing the Iraqs assets in and around world banks, nor the safety boxes in the Banks, nor did they stop at stealing the museums and selling the artifacts in secret auctions, not did they stop at stealing the personal money and woman jewelry from our citizen's homes, nor will they even stop at other programmed looting operations that we will disclose at the correct time, for they have launched an illegal war on a nation that is simply a treasure that never dwindles in resources. This is why we reserve the right to bring to justice the war criminals of this war!!! As for the story of the disappearance of 70,000 tons of Brass/Copper, which by simple calculation is equivalent to 3,500 trailers (Truck load), and was there laying in several military plants, with their production lines. It is a story that is more like something from the Thousand and one nights stories were Shahrezad tells her stories on Abu Nuas Street. For this we ask the War criminal Bush and his Generals, how did hundreds in the least reached the Jordanian Government? How did the Kurdish Gangsters export thousands of Tons to Iran & Turkey? How did the Iranian Parties in Iraq, transport thousands of tons to Iran and with the knowledge of the British forces, all free of charge, and in Gratitude for their ongoing role in keeping the south quiet, and in fulfillment to the secretly agreed compensations! How did thousands of Tons reach Bombay and the United Arab Emirates, under the supervision of the British forces? The invaders and by plan of the pentagon, crafted since 1990, the criminal sanctions for 12 years then to annihilate Iraq as a nation, a people, and a civilization. But now they have finally realized that the American Empire is in a great problem, for their mercenary allies are escaping gradually, & their soldiers are under the guillotines of the Resistance. And the government of traitors is no more than a Mirage "A Mirage!" We are not surprised when Blair and his thieves steal, simply because all displays in the museums of London were stolen from other nations! As for the heads of the Financially broke Empire, for they know now that the Iraqi Army did not disappear and the Brass/Copper Disappeared, for the Army fights a war of liberty from the thieves! There will come a close day Bush, when you damn the day you invaded the cradle of civilizations our country only to steal! We have the oath of God! As with the other nine videos, it's hard to know what to make of the claims of the "Mujahideen Central Command." Obviously, a large black market in scrap metal has long been a feature of Iraq's post-war economy—and it's a safe bet the jihadis are unhappy at being cut out of a lucrative source of supply, not to mention a source for improvised explosive devices like the ones shown in this other Mujahideen Army video. The al-Shaheed brass factory at Taji, moreover, has been a subject of political controvery since the 1980s. This 1991 statement by Representative Henry Gonzalez (D-Texas) offers some useful background on the plant's checkered history. Compared to Soviet tanks and radar-destroying missiles, though, a scrap brass doesn't seem like much to get worked up over. But I suppose getting worked up is what the Mujahideen Army does best. The allusion to the tale of Aladdin and his magic lamp was a nice literary touch, though. History repeats itself, Karl Marx (or was it Groucho?) once observed, first as farce, then as something even more idiotic. We've seen plenty of corroborating evidence lately—from Linda Foley's Eason Jordan impersonation in St. Louis last month to the ongoing happy talk of European leaders in the face of consecutive French and Dutch snubbings of a proposed European constitution. Yesterday—not wishing to miss out on a hot trend, presumably—Russell Crowe ripped a page right out of the Naomi Campbell playbook and winged a telephone at a New York City hotel employee, causing minor lacerations to the victim's face. Crowe's attorney, Gerald Lefcourt, told Manhattan Criminal Court Judge Martin Murphy that Crowe has "never been arrested in this country" and that he is "a very, very charitable, a decent human being with an excellent background." Lefcourt omitted to mention, of course, Crowe's impressive history of bar brawls or the recent dust-up with his bodyguard, Mark "Spud" Carroll. 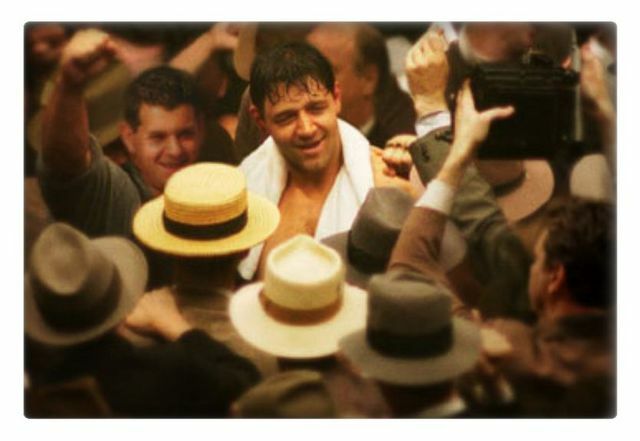 But, fortunately, Crowe has vowed to learn from his mistakes, citing the inspiration of his latest movie, "Cinderella Man." "I don`t want to get myself into a violent situation ever again," Crowe told London's Daily Mirror. "I`ve seen its effect. I`ve felt its effect. It`s not something I ever want to do again," Crowe said. Oh, wait … he said that before he winged the phone at the guy in New York. The top Democrat on the Senate Foreign Relations Committee said Sunday that the United States needed to close the military prison camp at Guantanamo Bay, Cuba, which housed suspects captured in the war on terrorism. "I think we should end up shutting it down, moving those prisoners," said Sen. Joseph R. Biden Jr. "Those that we have reason to keep, keep. And those we don't, let go." Well, let's think about that for a moment, shall we, Senator? Or would you prefer we just throw them all back—as I modestly suggested in this space last January? Better still, give them a nice fat check from the U. S. Treasury for the terrible injustices they've been forced to suffer. Just don't bother calling me on your cell phone to tell me your flight to Chicago's going down. As the staff of "The Note" has written: "This stalwart of the World's Most Deliberative Body continues to amaze us—and his colleagues—with his capacity to jabber on and on in high dudgeon and low, without any sense of how he is perceived." I don't often find myself agreeing with these folks, but I've got to hand it to them: They know a bloviator when they see one. Watch out, Alec Baldwin. There's a new mouth in town.